This statistic represents the PNC Christmas Price Index for 2018. According to the source, the index shows the current cost for one set of each of the gifts given in the song "The Twelve Days of Christmas." Among other gifts, these include a partridge in a pear tree, two turtle doves, five golden rings, nine ladies dancing and twelve drummers drumming. In 2018, the cost for nine dancing ladies amounted to about 7,552 U.S. dollars, the eleven piping pipers cost around 2,804 U.S. dollars, and the cost for seven swimming swans amounted to a staggering 13,125 U.S. dollars in 2018 – clearly the most expensive gift for your true love. 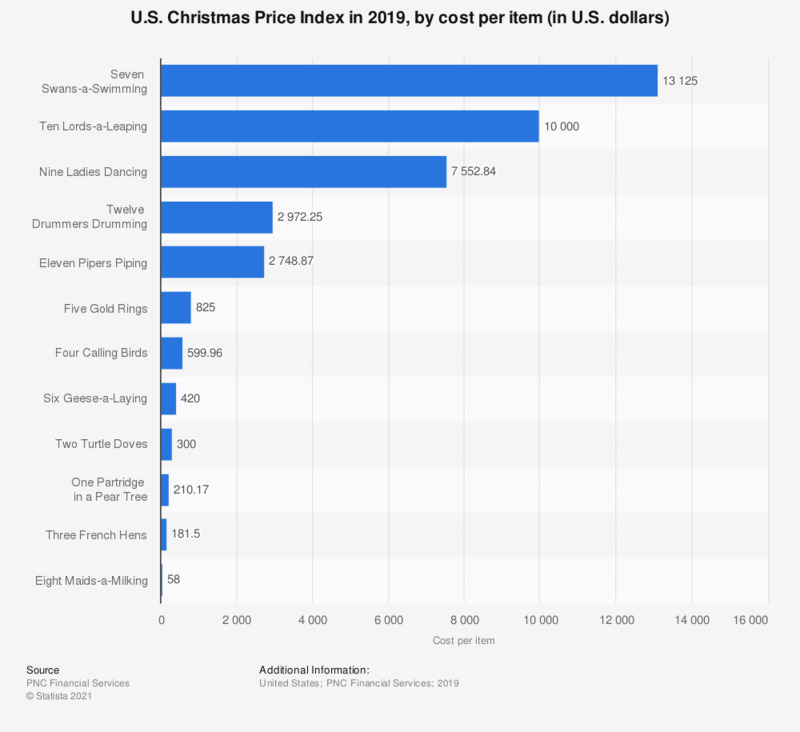 * According to the source, the PNC Christmas Price Index shows the current cost for one set of each of the gifts given in the song "The Twelve Days of Christmas." The price for the eight maids is represented with the minimum wage.